Along with the rising demand for power, there is a negative impact on non-renewable resources to meet these demands. In order to utilize the renewable resources and shifts towards clean energy, electrical appliance manufacturers are shifting towards the manufacturing of solar powered systems such as solar water heaters. Solar water heater uses solar energy, a technological step towards sustainable use of energy and power. Average annual growth of global solar thermal technologies (2015-2021) is 5.4%, and the major contributors towards global renewable additions are the China, the U.S.A. and India. China’s total solar thermal capacity in operation rose to 334.46 GWth in 2017. In Asia-Pacific per capita energy consumption in 2015 of South Korea was 5.51 tons, Australia (5.48) and Japan (3.54). APAC solar water heater market is highly influenced by various global and regional associations such as Sustainable Energy for All (SEforALL) Asia-Pacific Regional Hub, which is led by the Asian Development Bank (ADB), the United Nations Economic and Social Commission for Asia and the Pacific (ESCAP) and the United Nations Development Programme (UNDP) with the objective to double the growth rate of energy efficiency and double the share of APAC renewable energy in the global energy mix. Goldstein Research analyst forecast that the Asia-Pacific solar water heater market size is set to reach USD 3.9 billion by 2025, growing at a CAGR of 6.8% over the forecast period. The government initiative towards promoting solar water heater, investments in related projects, presence of number of manufacturers, development of smart cities, rising adoption of solar water heaters are some of the factors leading the solar water heater market towards positive growth. The report covers the present ground scenario and the future growth prospects of the solar water heater market for 2017-2025 along with the Asia-Pacific sales and revenue of the solar water heater. We calculated the market size and revenue share on the basis of revenue generated from major players across the globe. We have forecast the market on the basis of number of solar water heater projects, shipment unit data, manufacturers, investors, suppliers and distributors. On the basis of product type, active solar water heater accounted for largest market share of 56.4% in 2017 of the total Asia-Pacific solar water heater market. As compared to passive solar water heaters, active solar water heaters are more efficient and that is the major reason behind the consumer preference of active solar water heaters. Expansion of commercial sector is growing the solar water heater market at a rate of 5.8% annually, whereas residential sector is opportunistic segment for solar water heater companies. Solar water heater market outlook 2017-2025, has been prepared based on an in-depth market analysis from industry experts. The report covers the competitive landscape and current position of major players in the solar water heater market. The report also includes porter’s five force model, SWOT analysis, company profiling, business strategies of market players and their business models. Asia-Pacific solar water heater market report also recognizes value chain analysis to understand the cost differentiation to provide competitive advantage to the existing and new entry players. Hybrid solar water heaters are in trend, which maximizes the available solar radiation using parabolic coil collector. Hybrid solar water heaters significantly take less time to heat up the water as compared to conventional solar water heater. The efficiency factor makes it cost effective and works at low running cost, which attracts the commercial facility owners to adopt cost efficient and green energy systems. Asia-Pacific region lies in the Earth’s tropical belt that receives maximum solar energy throughout the year, which attracts most of the solar water heater installations. Solar water heaters are zero-emissions, zero-waste solution to other environmentally destructive problem form other methods of heating water. This has been the major driving factor for adoption of solar water heaters that helps in reducing carbon footprint. The major challenge for the solar water heaters is the lack of national policy on renewable methods of heating and absence of project dealers in rural areas for the installation of solar water heaters. Though China is a leading country in adopting renewable energy sources in power generation but it is an apt example to these challenges. Based on geography, China accounted for 43.8% market share in 2017 of the total Asia-Pacific solar water heater market. China has been increasing its involvement in clean energy heating on the back of its 13th five year plan (2016-2020), thus it has connected solar water heaters in 180 single family buildings among other finished projects. India solar water heating market is growing at a rate of 4.1% annually, covering 34.1% buildings connected with solar water heaters. 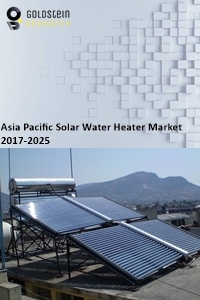 Asia-Pacific solar water heater market report comprises of the following companies as the key players in the solar water heater market: China Hitek Solar Co. Ltd., Azuma Solar Co. Ltd., EMMVEE Solar Systems, Jinyi Solar, Chromagen, Genersys, Rheem Manufacturing, Alternate Energy Technologies, Apricus Solar, A. O. Smith, Heliodyne, HTP, Inter Solar Systems, Nuetech Solar Systems, SunEarth, and Vaughn Thermal and others. What is the revenue of solar water heater market in 2016-17 and what would be the expected demand over the forecasted period?